Last night was "one of those nights". My little boy started crying at 11pm and went all the way through until 7:30am. I am not the cry-it-out kind of mom...I cannot stand to hear him cry. Which means I was literally rocking him for 8+ hours. We went into acute care, fever of 103 degrees and double ear infections...thank God for antibiotics. I am praying he sleeps through the night tonight. After a night/day like this dinner had to be easy and a little sugar never hurts. 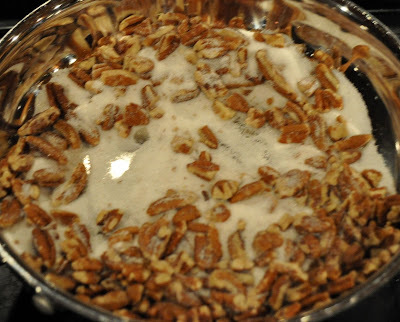 In a nonstick frying pan, mix sugar, cinnamon, pecans, vanilla and water. Stir together and heat on medium high heat. Stir continuously for about 5-10 minutes until the glaze gets thick and sticky and the liquid evaporates. Quickly remove pan from burner and add 2 teaspoons of water to steam the nuts. Stir the nuts to coat evenly. Spread the nuts on a parchment paper lined baking sheet to cool. 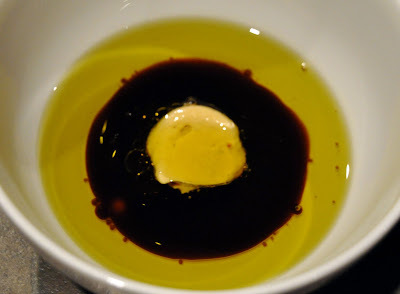 Whisk the dressing ingredients: olive oil, balsamic vinegar, mustard. Add kosher salt and freshly ground pepper to dressing. 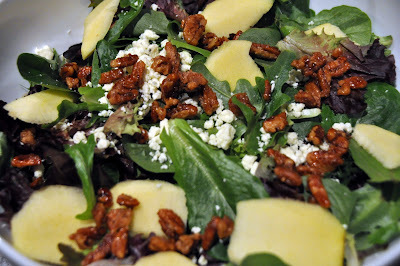 In large bowl add greens, apple, blue cheese, pecans and drizzle lightly with dressing. You fixed the comments! 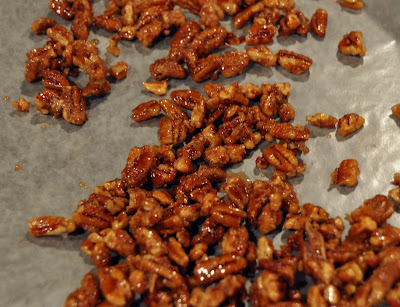 LOL, I make the same candied pecans, only I have a gadget. 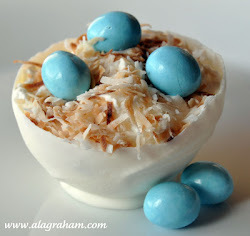 Look for it on my blog. Were we separated at birth? Hope your baby is doing better. Sleep deprivation doesn't agree well with me.